Have you ever found yourself blaming? Blaming something or someone that is the reason for your loss, your frustration, or your lack of progress? You know, about anything that you feel you should have, would have had or could have had if it weren’t for _______________? Something you felt you were entitled to? There are plenty of targets: the government, the schools, your parents, your childhood. Pick anything, the list is endless. As you can see entitlement mainly refers to benefits specified by law or a government program or the belief that one is deserving of or entitled to privileges. So unless you are on some government program or own a country you aren’t really entitled to anything. But you might say “I am entitled to my freedom”. And you would be wrong. What you have now or want in the future has depended and will depend upon your own actions, upon your efforts. If you have traded your time for money to earn a living, that was your bargain. That was the deal you made. If you are an entrepreneur, you accepted the stress and pleasure of being in business for yourself and that was your bargain. That was your deal. But in all cases, you are the driver. It is a choice you made and you reaped the results, whatever they were. The second you look outside for a reason or for the cause of your current circumstances, you step into "victitlement". Because believing that you are owed anything is being a victim, it is giving up your power by believing that things come from outside of you, from somewhere else. That life happens to you. That is not true. You happen to life. You are your creator. You visualize and through your actions (or inactions) you create your own reality. 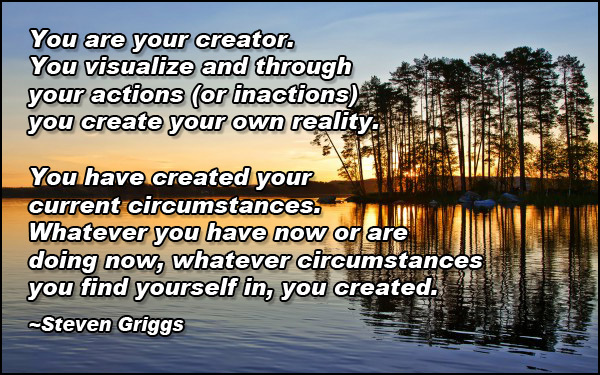 You have created your current circumstances. Whatever you have now or are doing now, whatever circumstances you find yourself in, you created. And that is sometimes hard to accept….. I am assuming you choose to be the master of your destiny and not answer to anyone. But for some that is uncomfortable and maybe not be achievable at this time. If so, for now you compromise and do what you have to do. You wait and plan until the time is right. Your level of independence and freedom is a choice. But wherever you are, you don’t get to complain. No one does. By being a victim and feeling entitled you allow yourself to become a floating blob of helplessness, pushed by the currents of others, never consciously in control, always the victim. “Waiting for someone or something to show you the way” as Pink Floyd says. That would be living in a state of “victitlement”. Accept responsibility and accept that you are in control, avoid victitlement and create the reality you choose.